You'll need your own Google Apps domain to utilize these apps. They can't be used with standard Google accounts (those with a free Gmail address), although they work fine with the free 50-user version of Google Apps. 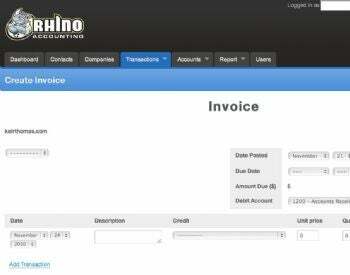 Rhino Accounting is free double-entry accounting app in the same style as QuickBooks. Once it's installed you can track income against expenditure, create invoices (which can then be seamlessly e-mailed), and even create paychecks. Rhino isn't for the newbie accountant, lacking setup wizards or even help files, but anybody with a knowledge of existing accounting packages or practices will find the interface intuitive. >Integration with Google Apps comes in the form of importing contacts, although at present you must create entries for companies manually, and only companies can be invoiced. However, each company you deal with need only be added once. Once the app is installed, you'll need to enable a Google Labs feature that allows you to add a gadget by its URL. This can be done by clicking the Settings link within your inbox, then the Labs link, and then putting a check alongside Add Any Gadget by URL. Click the Save Changes button and then access Settings again, this time clicking the Gadgets link. Then, in the URL field, enter the following, replacing mydomain.com at the end of the link with your Google Apps domain, such as: http://appogeebookmarks.appspot.com/gadget?hd=mydomain.com . 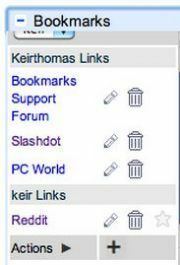 Click the Add button and, upon returning to your Inbox, you'll find the Bookmarks app window below your chat window at the left. Adding a link you want to share is a matter of clicking the "plus" icon and entering the details. Clicking the Domain checkbox will share it with the rest of your users. Otherwise it will remain a private link only visible by you.